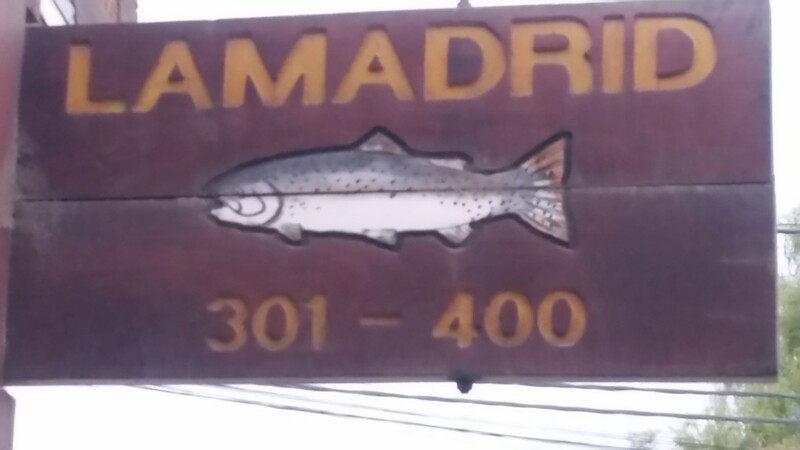 I arrive in Junin de los Andes in the afternoon and circle the central plaza, find a parking space in front of a popular looking sidewalk café, sit down to a beer. My table looks out at the peaceful plaza which is heavily treed with paved paths crisscrossing it. 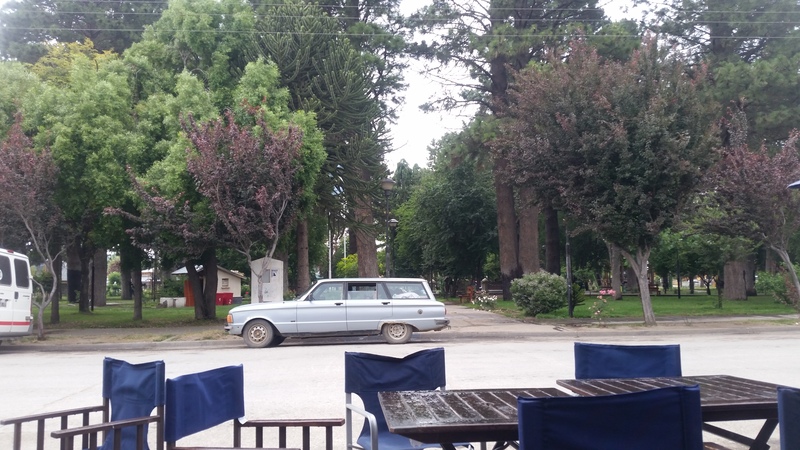 Enjoying a beer at my table looking out at the Plaza in Junin de los Andes. I see old Ford Falcons every day. I research local camping and decide on the municipal campground, only a few blocks away, located on an island in the Chimehuin River. I finish my beer and make a loop around the plaza checking out downtown and then head to the campground. Not a very good photo but wanted to show the campground is right on the river. I could have cast a line from my campsite. There turn out to be two campgrounds on the island, one private and one municipal. I settle in at the municipal campground right on the river. 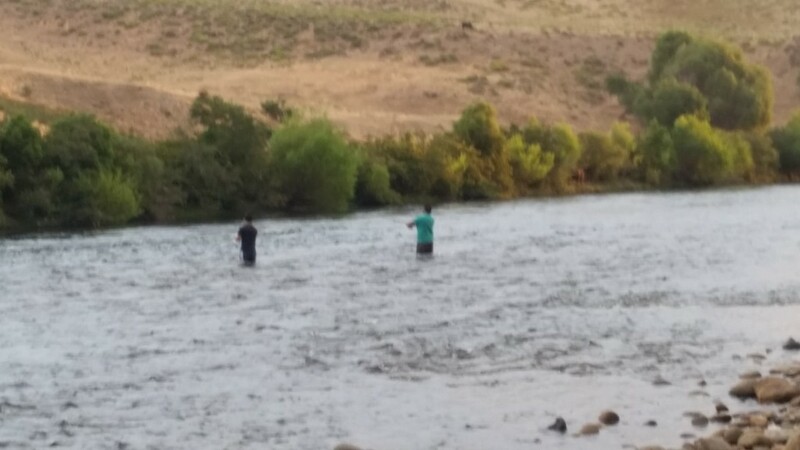 There are several serious looking fly fishermen in waders and a group pulling a drift boat from the water. The fishing looked pretty good, I am told rainbow and brown trout are plentiful. I notice that it is pretty dusty, and a fine coat begins to settle on everything. I am told by one of the other campers that this is volcanic ash from one of the volcanoes, probably Villarica, that erupted in February and March of 2015, just across the border in Chile. I remember experiencing this kind of ash after Mt. Saint Helens in Washington erupted back in the 80s. I make the 10 minute walk off the island and back downtown to look for dinner. 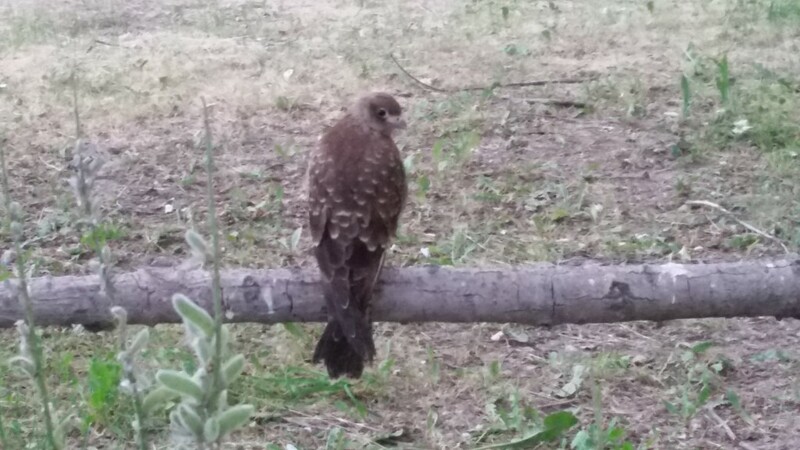 I am amazed at all of the strange birds I see along the way. Someone tells me that one kind of bird I am watching is a Bandurria, or black faced Ibis. 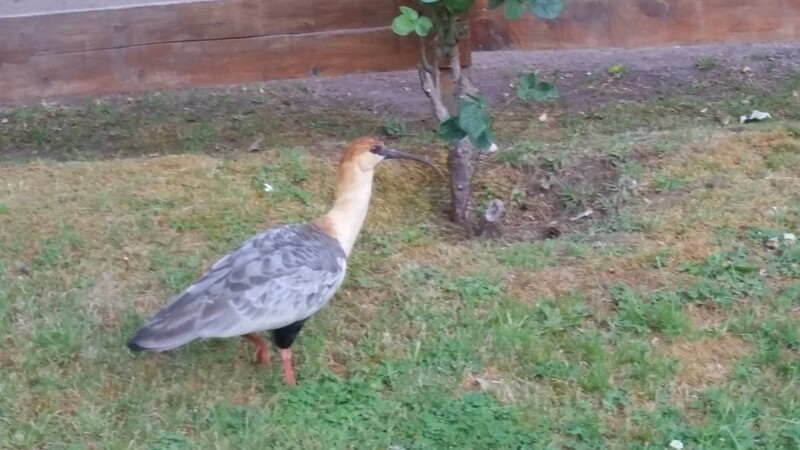 Locals call it a Bandurria, I think it is an Ibis in English. I also see large groups of what look like parrots to me, sitting on wires and posts and living in holes in the sides of buildings but wasn’t able to take a clear photo. I couldn’t get a shot of the parrot like love birds but this guy held still for me. I see so many strange birds that I have not seen before. The town is really pretty. Street signs have salmon or trout on them and there are flowers blooming everywhere. The town is very pretty, even the street signs are nice. It really has the feel of a tourist resort centering on fishing. There are many outdoor outfitters and prices seem to be slightly higher here. 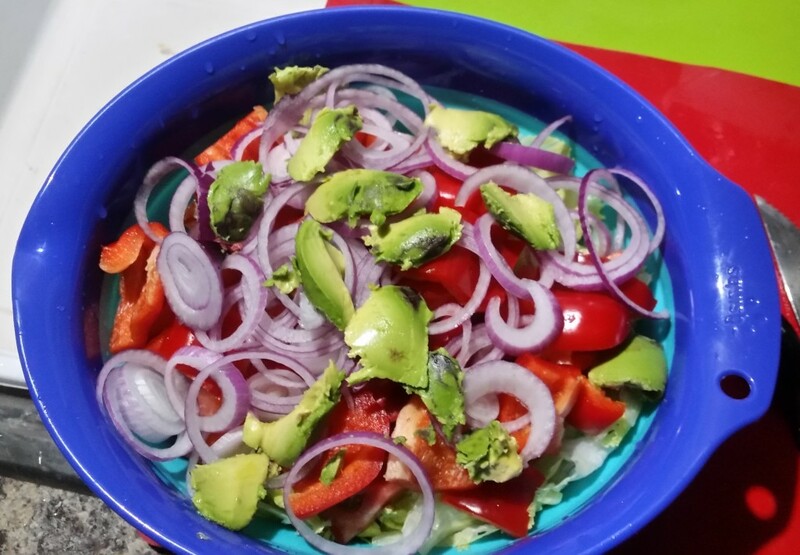 Some nice looking restaurants, the most popular are the many offering eat-in or take-out barbecue with whole animals staked over fire pits and fresh river salmon. The city hall and many nice gardens gardens really made this town pleasant. I wander into a produce market and my decision is made. I walk out with vegetables for a stew and a salad and a bag of apples. I could really eat well and economically here. I will have to do the preparation myself but it will be worth it. My kind of store, produce and wine! Back at the campground, while I make my salad it seems every campsite is preparing there camp barbecue fire. In Argentina you can almost set your clock to 9:30 p.m. by the smell of barbecue and wood smoke. 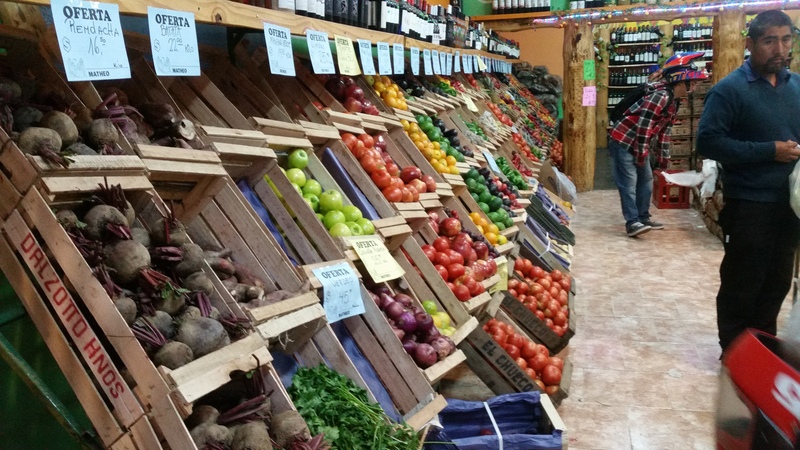 Great produce, great prices, dinner. 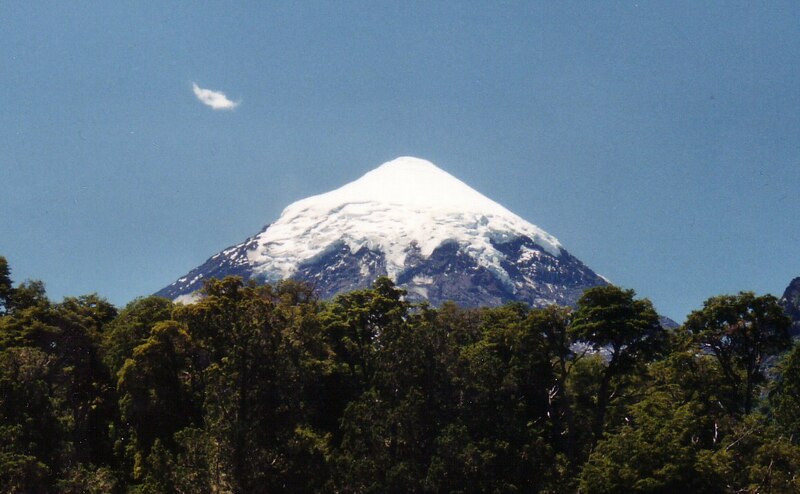 In the morning I head west toward Mamuil Malal Pass to visit the 12,293 ft. Lanín Volcano and Lanin National Park. 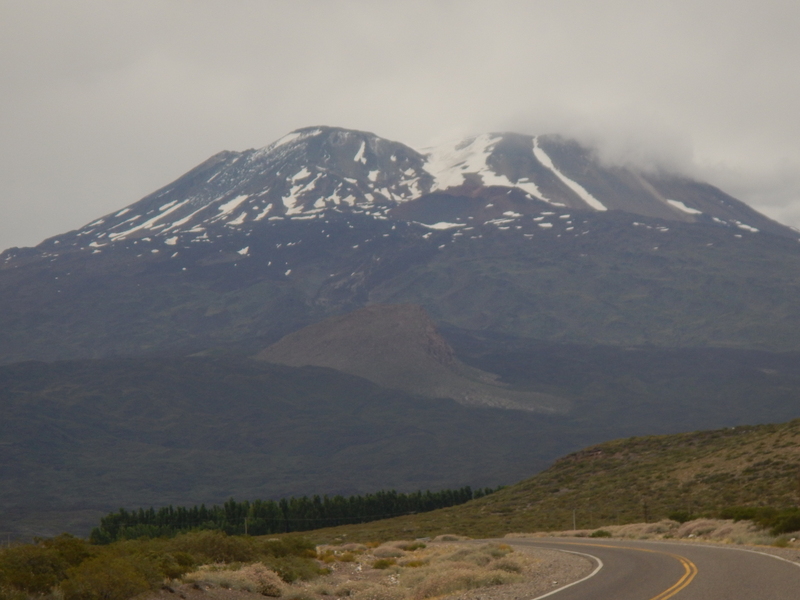 The Lanin Volcano near the border with Chile near Junin de los Andes as seen from Mamuil Malal Pass. The road through the pass crosses the Andes to Pucón Chile. The last 25 miles of the road on the Argentina side is unpaved and runs through Lanin National Park. 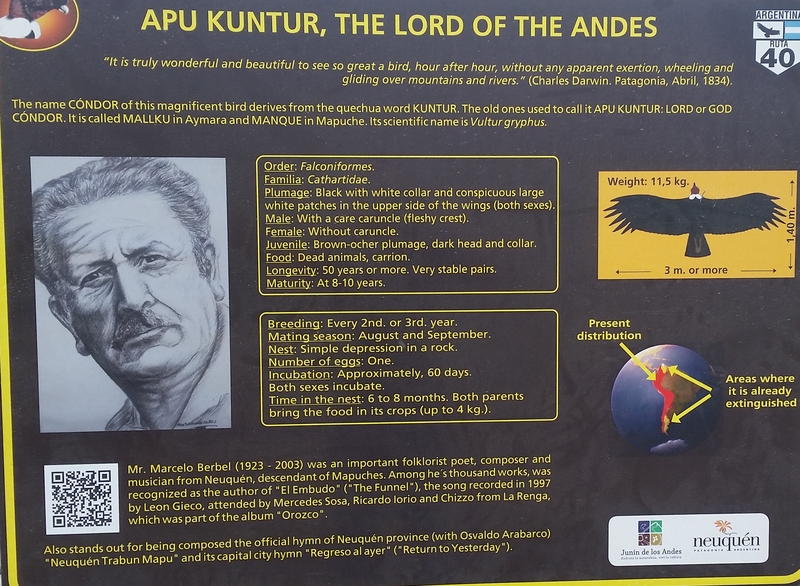 I leave Route 40 and drive up toward the border with Chile to visit Lanin National Park Just across the border from Pucon. 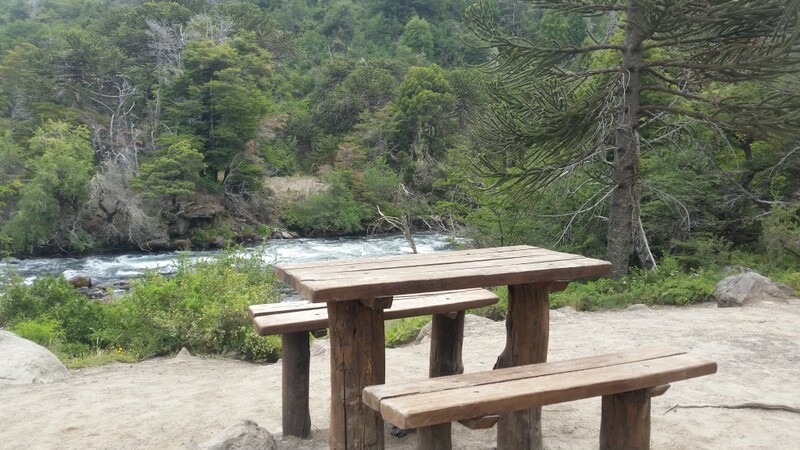 I stop at the trail head to the Lanin Volcano about 2 miles short of the Chilean border, it is around 40 miles beyond the border to Pucón. 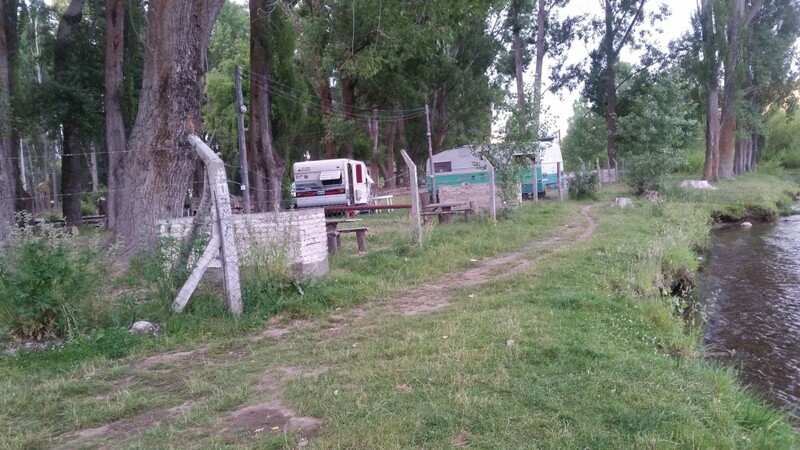 On my previous trip to Patagonia by motorcycle I stayed overnight in Puócn. 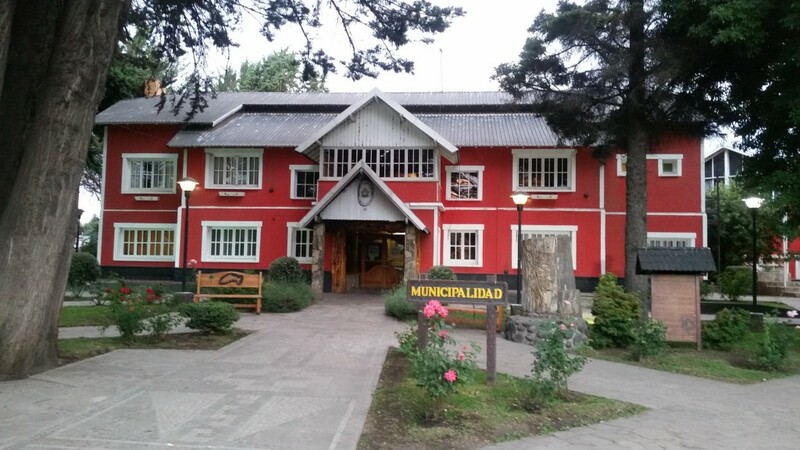 Pucón is a very nice tourist town, next to the Villarica Volcano, and is very close to here. Once again I am rewarded with the scenery. I stop for lunch at a picnic table alongside a beautiful but noisy river. I stopped for lunch in the national park at this riverside picnic table. Beautiful area. I am in a forest of Auracania trees, or in English, Monkey Puzzle Trees. The road through the park is pretty rough and rocky which surprises me since Wikipedia said it was paved on the Argentine side. 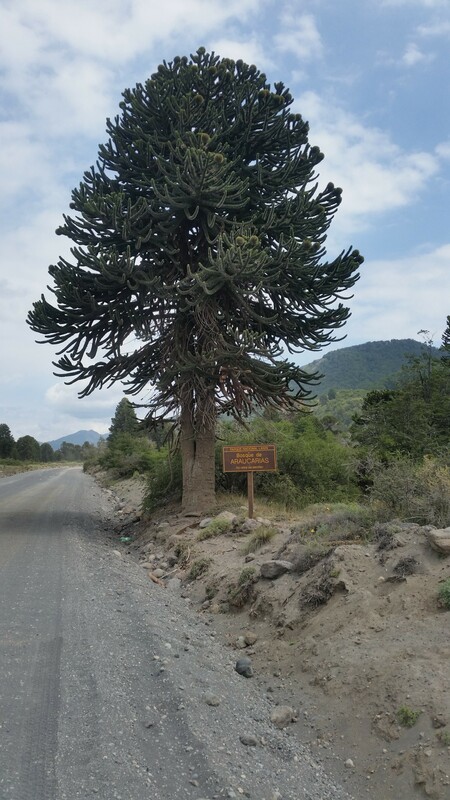 The Monkey Puzzle Tree or in Spanish Araucania is typical in this area. If you look closely you will notice a coating of volcanic ash on everything. Just short of the Chilean border I arrive at the trailhead for the mountain and across the road from the access road to Lago Tromen. Out of an over abundance of caution I decide not to leave the truck and camper un-attended in the trail head parking lot to hike to the volcano. 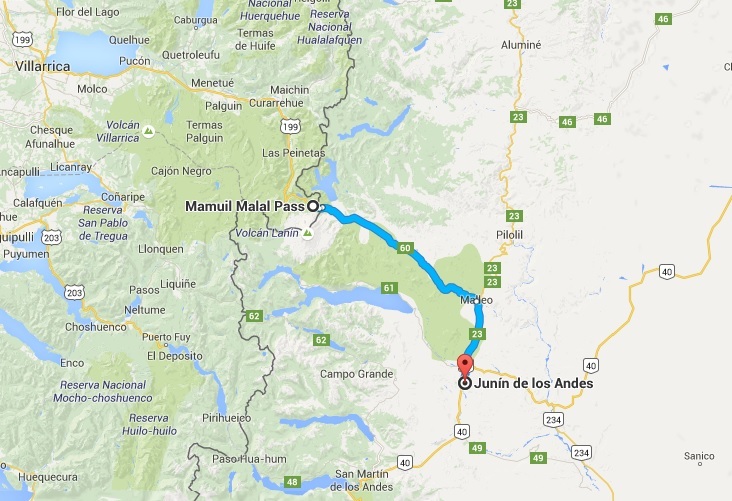 After a visit to the tourist information center I backtrack my way to Junin de los Andes, and then on south a short distance to San Martin de los Andes, what I will consider the beginning of the lake district. Today I head south on route 40 departing Mendoza Province and entering Neuquen Province. 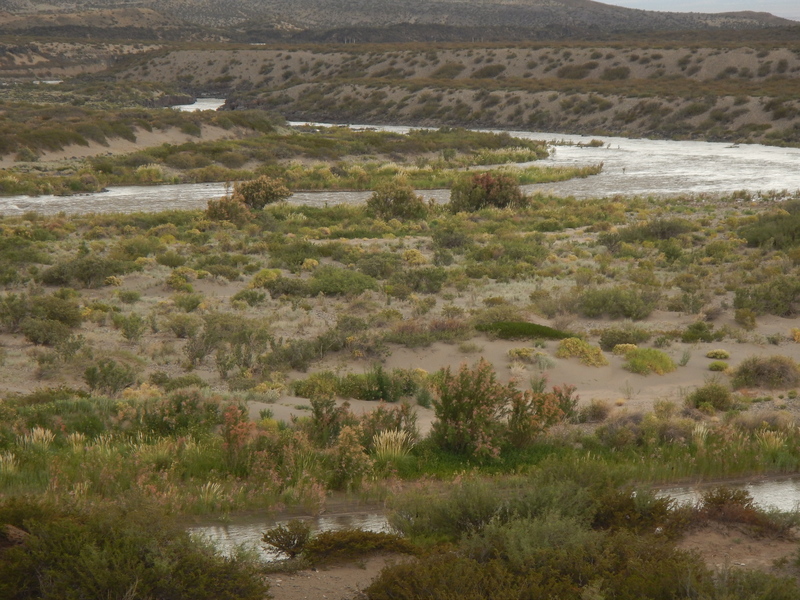 The Barrancas River flows into the Rio Grande River and then into the Colorado River to form the provincial border. I am now officially in Patagonia. Patagonia extends from here, the Mendoza/Neuquen provincial border, down to the southern tip of Argentina and includes the archipelago of Tierra del Fuego. 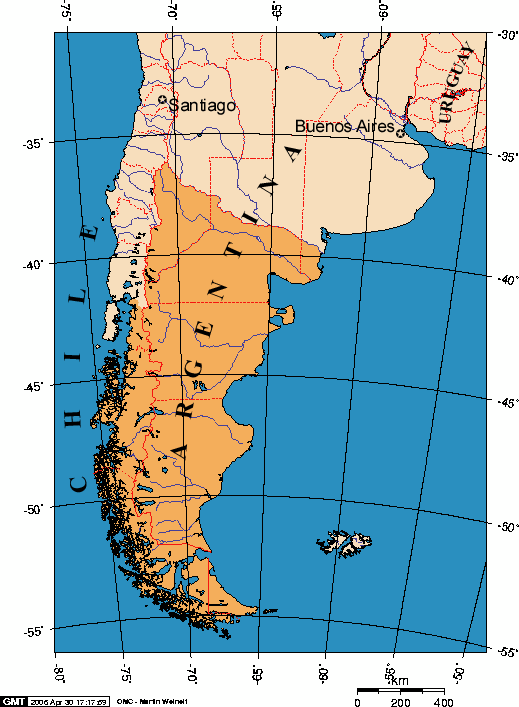 On the Chilean side of the Andes, Patagonia begins a little farther to the south at the Reloncavi Estuary and like Argentina includes the entire southern end of the continent. Sparsely populated Patagonia extends to both coasts. 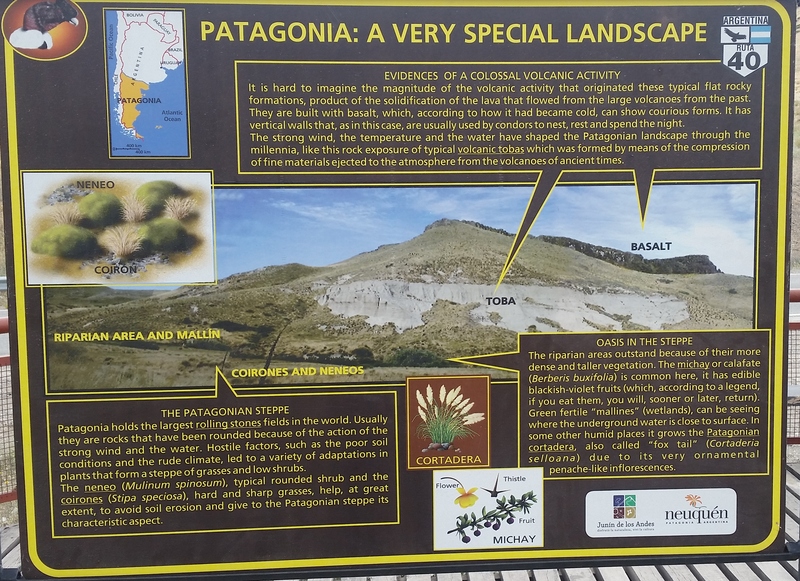 Patagonia begins at the Mendoza Neuquen provincial line in Argentina and at the Reloncavi Estuary, a bit to the south in Chile, and extends to the southern tip of the continent from coast to coast, including the archipeligo of Tierra del Fuego. 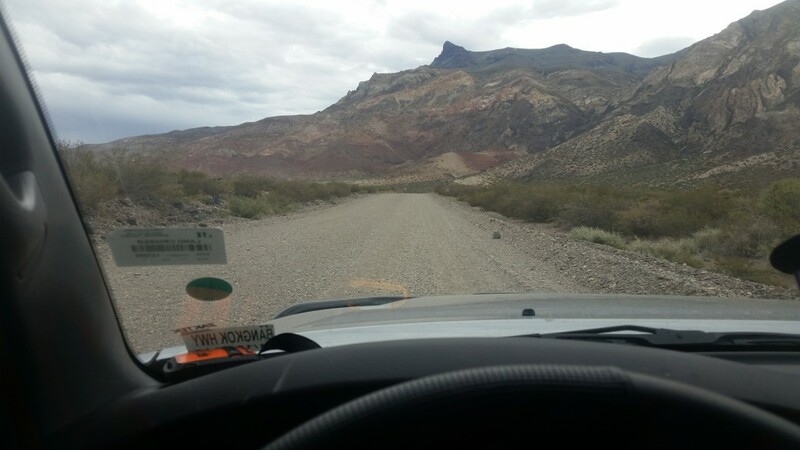 Much of today’s driving, about 75 km out of 160 km, is over unpaved, pretty rough road before joining the pavement again. Unpaved section of Route 40 south of Malargue and north of Chos Malal. Though I am driving through semi-arid desert landscape, the scenery is stunning. The mountains and hills appear to be painted on canvas. 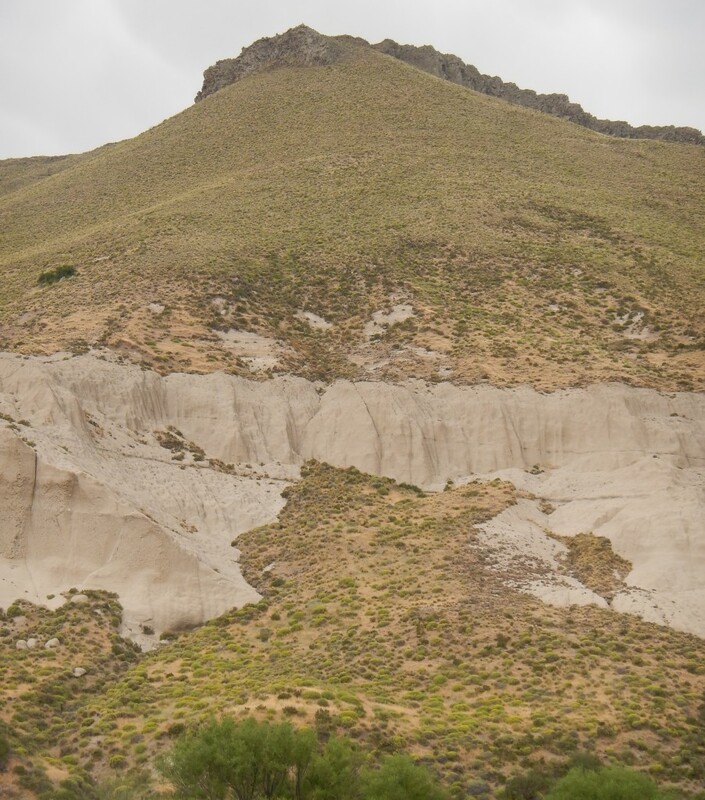 Stark rock formations, lava flows, calderas and other geologic formations abound. Wherever there is water trees, shrubs ,and wild flowers are growing. Glacier capped peaks border the horizon. It is a spectacular drive. The hillsides are painted and sculpted. 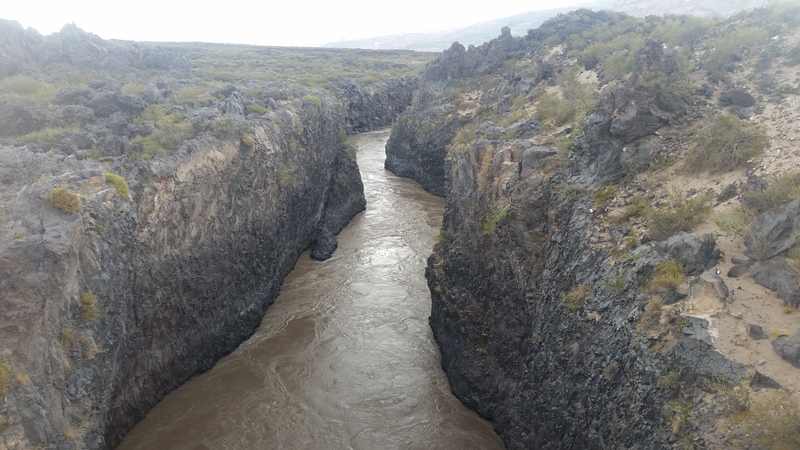 Much of the route this morning follows the sprawling Rio Grande River which is winding its way down from the Andes to join the Rio Colorado and flow into the Atlantic. I pass an few fishermen enjoying the river. Route 40 follows along the sprawling Route 40 much of the morning. 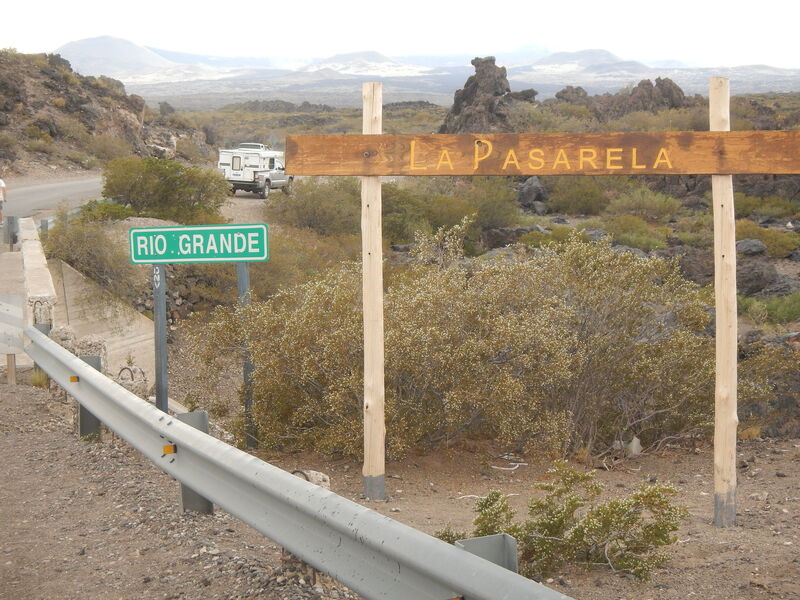 I am surprised to happen upon “La Pasarela”, where the sprawling Rio Grande flows or cuts its way through a lava flow. Somebody has erected a home made sign and made a tourist attraction out of it. Where Route 40 crosses an old bridge to span the Rio Grande which is flowing through a crack in the lava flow. The sprawling Rio Grande hits a lava flow and cuts its way through. I finally get back on pavement, the scenery continues and a volcano appears along my route. I later learn it is the 13,497 ft. Tromen Volcano, which last erupted in 1822. Tromen is a stratovolcano tall and once pointed unlike the flat shield volcanoes seen yesterday. The 13, 497 ft tall Tromen Volcano pops up along my path. I have a short wait in the block long line for fuel and then fill up. The attendant explains to me that this town is famous for being the mid-point on the north/south Route 40. I stay in the municipal campground which is five minutes walk from downtown and even receive a senior citizen discount of 50%. WiFi is scarce in town. I finally find some internet to check my email after buying a bottle of overpriced mineral water at a local hosteria/restaurant. Back on route 40 the following morning I happen upon an elaborate monument. 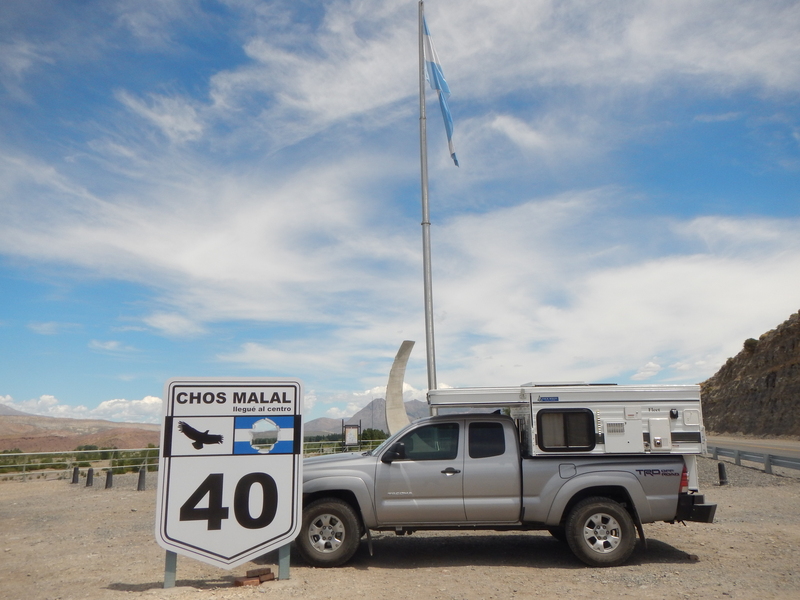 Chos Malal is very proud to be the geographic center of National Route 40. 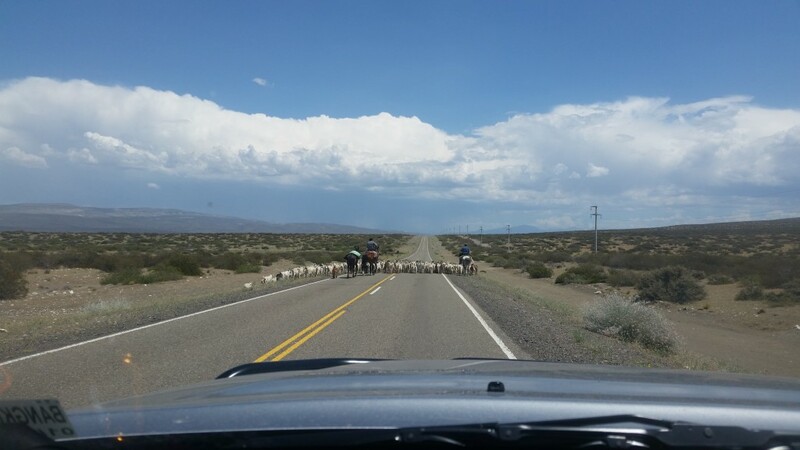 Route 40 runs 3,250 miles parallel to the Andes range and connects over 210 villages in eleven provinces. 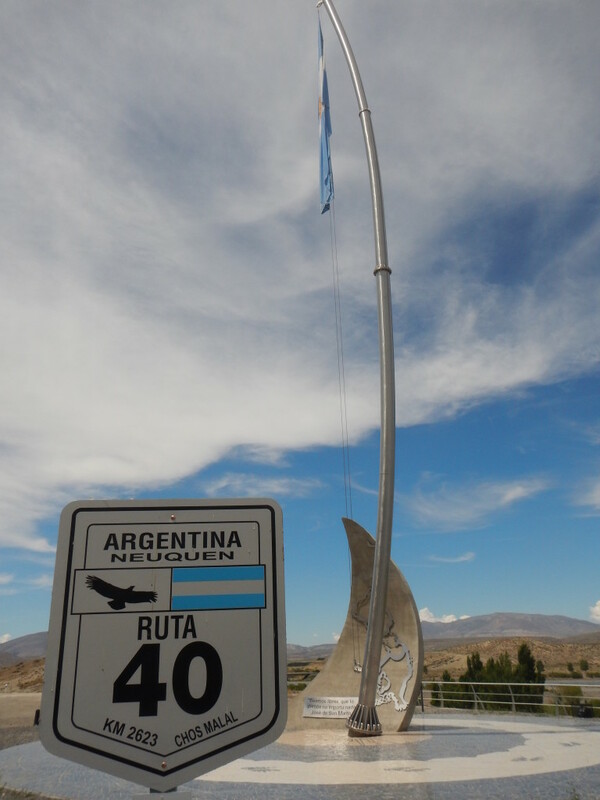 The monument marking the midway point, north end to south end, of Argentine national Route 40 at Chos Malal. The design of the monument is interesting. The flagpole is curved to depict the year round strong winds in Patagonia usually from the west. The wall displays a map of the western hemisphere, upside down, with North America at the bottom and South America at the top. This display is a proud symbol of the Argentine and Latin American perspective that there is no up and down, just a matter of perspective. There is no first world and third world. On the wall inscribed in Spanish the words of early liberator General Jose de San Martin; “Let us be free or nothing else matters”. Interesting monument to the midway point of route 40. 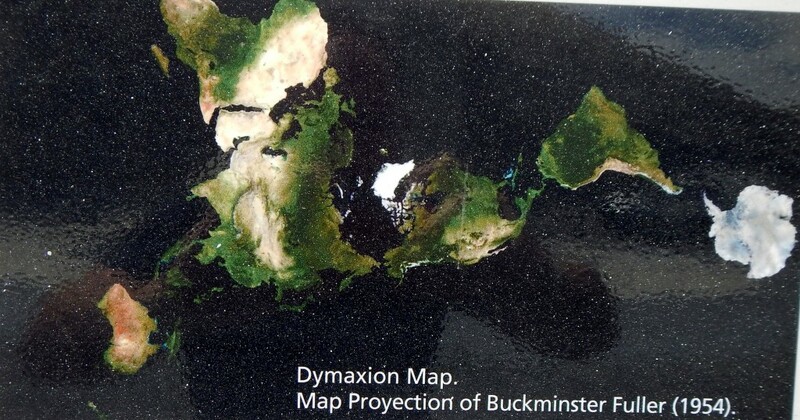 As a big fan of Buckminster Fuller what I find most interesting about the monument is the display of Bucky Fuller’s Dymaxion map. The explanation is that whenever a curved surface is displayed on a map it is a distortion to suit the use for which the map is intended. In the monument is displayed Bucky Fuller’s Dymaxion map from 1954. There is no up and down, just a center of gravity. Several times throughout the day I must slow or stop to avoid livestock of every description on the road. I frequently see Gauchos. Maybe I should have left the road? They made room for me but it may have been easier to go around off road. They did give me a funny look. I continue through the gorgeous scenery of Route 40 to the town of Las Lajas, in english “The Flagstones”. The name of the town which was founded in 1882 comes from the name of a nearby creek whose bed is covered in flagstones. Just before arriving in Las Lajas is a pull off to a view point that overlooks the town on the river. Looking down from the view point just north of town before descending down to the town and river. Tonight’s campground is at the right end of photo across the river. Having read reports of the nice campground, I decide to spend the night. Las Lajas is located on the Agrio River, which means sour river in English. The municipal campground is family run with all of the amenities. It has a private footbridge over a small channel to an island with a nice beach on the main tributary of the river. I am going to have to learn to fly fish. I am informed that the campground gates are closed and locked at 11:00 p.m. This is the first time I have heard anything like this in Argentina. I am told that everything in town is closed by 9:00 p.m. and there would be nothing to miss. The following morning I again head south on Route 40. 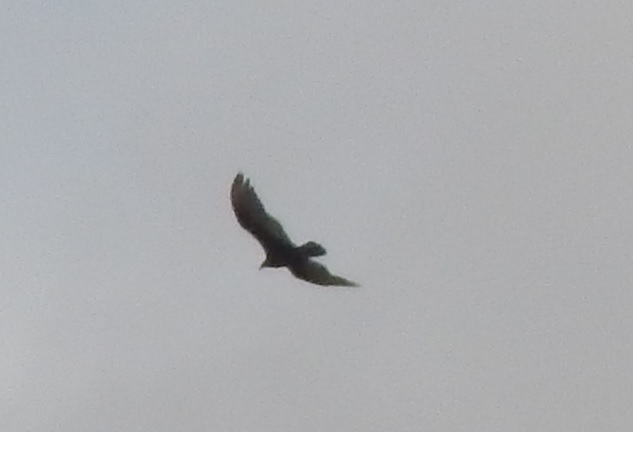 Several times today I see low circling Condors. Whenever I pull over to try and get a photo the elusive creatures drift away. I see many condors circling low overhead today but they are camera shy. I manage to capture one. Today’s scenery includes high basalt bluffs where condors nest rising up out of the desert. 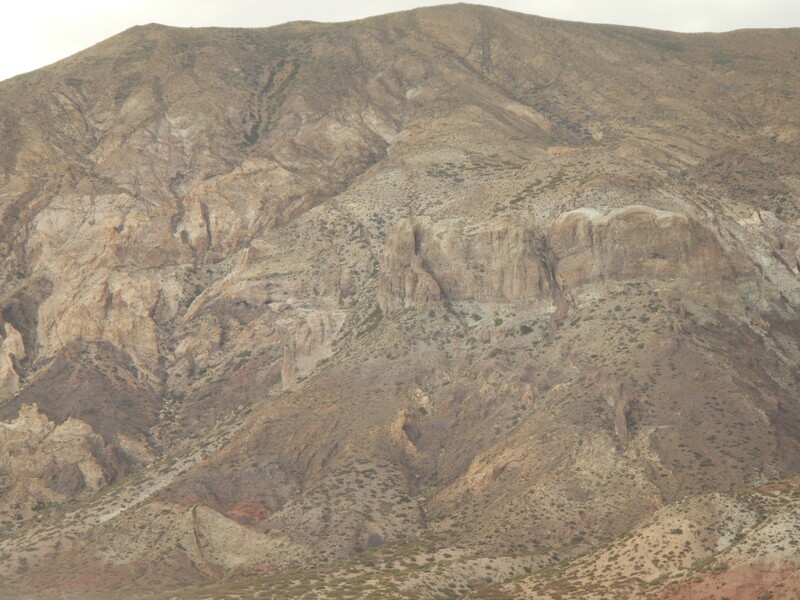 The basalt cliffs at the top of these hills and bluffs are the perfect nesting ground for condors. I come upon an informative roadside information display about condors and their habitat. Roadside Exhibit about Condors and their habitat. Click on the photo to enlarge for reading. Roadside information point on Route 40. Click to enlarge. 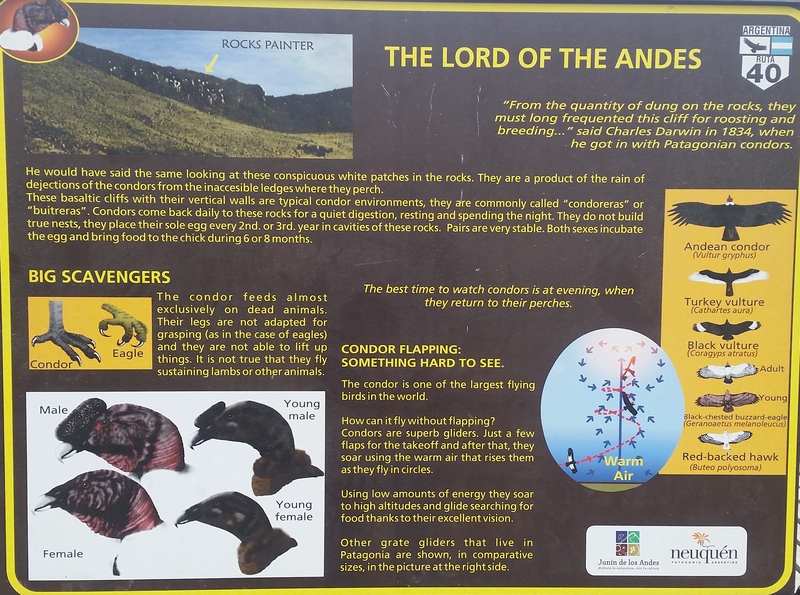 Photos of a roadside display about condors and their habitat. Click to enlarge. 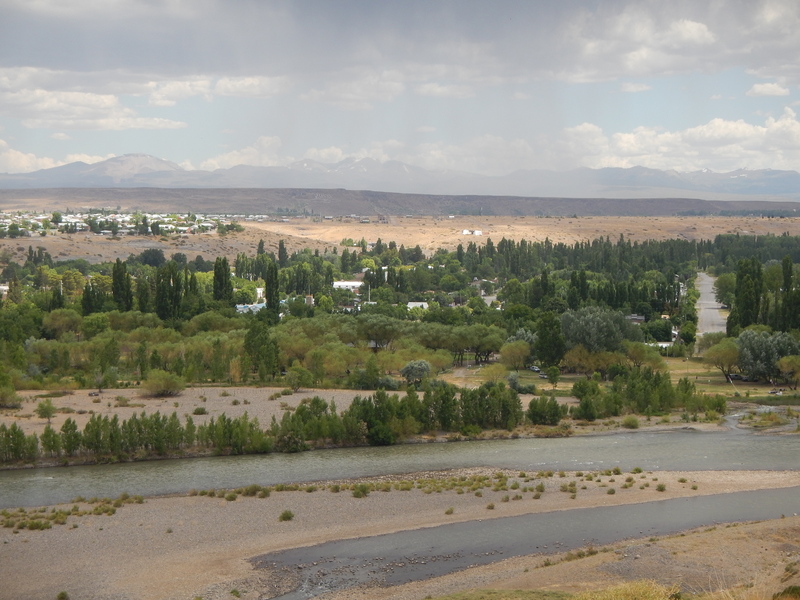 The radical terrain and scenery continue as I continue south to Junin de los Andes for the night.